[SatNews] The 2015 edition of the Space Foundation's annual flagship publication The Space Report: The Authoritative Guide to Global Space Activity is now available, containing worldwide space facts and figures and and illustrated with photographs, charts and graphs. In 2014, the global space economy grew slightly more than 9 percent, reaching a total of $330 billion worldwide, up from 2013's $302.5 billion. Together, commercial space activities made up 76 percent of the global space economy. The industry as a whole demonstrated a compound annual growth rate (CAGR) of seven percent from 2005 to 2014, nearly doubling in size over the course of the decade. U.S. government space spending went up slightly, 2.9 percent, from 2013 to 2014. The U.S. devoted 1.2 percent of the government's national budget to space in 2014. During that year, U.S. government space spending made up more than half of what all governments around the world spent on space. Space expenditures by governments other than the U.S. grew 12.9 percent in 2014, in spite of decreases in budgets of international cooperative efforts such as the European Space Agency. In 2014, global navigation satellite system receivers, such as the ones integrated with smartphone microchips, were the primary driver behind a nearly 18 percent increase in revenue for commercial space infrastructure and support industries. More than 3 billion mobile devices receive signals, not only from U.S. GPS satellites, but also from the Russian GLONASS and a variety of satellite-based augmentation systems. About 2.8 billion location-based application services were downloaded to these mobile devices during 2014. The overall value of satellites launched in 2014 decreased by 13.6 percent from 2013, partly driven by decreases in the number of high-value military satellite launches. The number of people employed in the civilian U.S. space workforce continued to decline in 2013, the latest full year for which data is available, with an estimated loss of nearly 6,000 employees. From 2006 to 2013, the U.S. space workforce declined about 14 percent, losing nearly 40,000 space specialists. Preliminary data for 2014 does not indicate the decline has reversed yet. Wages for those remaining in the U.S. space industry remain high. The average annual salary was $108,000 for a U.S. civilian space employee in 2013. Employees working in the guided missile and space vehicle manufacturing sector averaged the highest salary of nearly $120,000. The average age of an employee working in the aerospace and defense industry continues to climb, reaching slightly over 46 years of age. NASA started fiscal year (FY) 2015 with 17,731 employees, losing slightly more than 1,000 people since FY 2011. The retirement or cancellation of several major programs during that period corresponds with the losses. In FY15, 17.6 percent of NASA's workforce was eligible for retirement, and 15 percent of NASA's employees were under 35 years old. Europe's space workforce continued to grow, having added 7,600 employees since 2005. Six of Europe's countries account for 90 percent of Europe's space workforce, with France, Germany and Spain experiencing growth, while others declined. Starting in September 2015, the Space Foundation will offer an online service that will provide subscribers with access to all the research conducted for The Space Report dating back to 2005, as well as new data sets that have never appeared in the report. This website will provide users with updates throughout the year, customizable chart and downloadable data for further analysis. 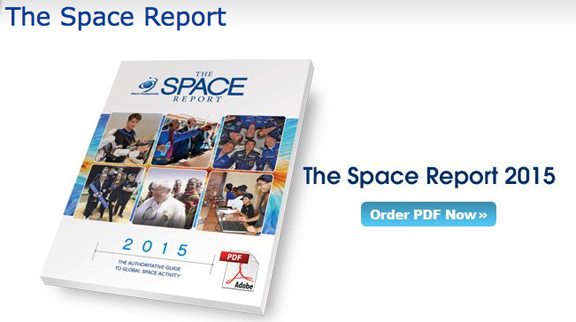 To view more information about this new service, and to download a report PDF, please visit http://www.TheSpaceReport.org/.